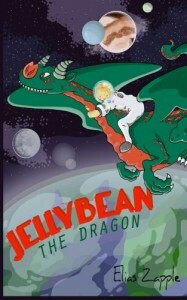 Jellybean the Dragon is a hilarious book to read aloud to the younger crowd. Ten year old Emma owns a castle and a spaceship big enough to fit a dragon--as long as it holds its breath, that is. She's just graduated from astronaut school , so when Jellybean the Dragon drops down from the sky because his wings don't work properly, she 's able to fly him back to his planet Zanu. Entertaining, as well as being a great vocabulary builder, this zany book is sure to be a winner with the 6 to 10 year olds.